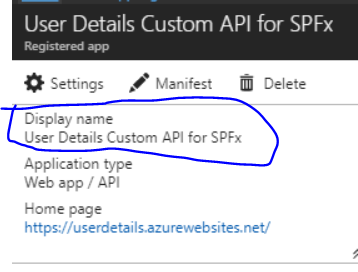 I am consuming an Azure API app in a SharePoint Online react app. I am following this article. But when I try to approve the app permissions on the API management page (SharePoint admin centre). When i run gulp serve on the webpart appears but no data appears. Can someone confirm if the GUID in the .getclient method is the applicationID of the Azure API. In the console log i get the following error Now I get another error. Failed to update App ID URI application property. Error detail: The App ID URI is not available. The App ID URI must be from a verified domain within your organization's directory. I did try to add another domain under Azure active directory -> custom domains. It said the domain needs to be verified but will be done only after 72 hours. As mentioned in the blog, you need to use the display name of the Azure AD application which you have registered in your Azure Portal. The display name needs to be the same in the SPFx's package-solution.json file's webApiPermissionRequests attribute. You are currently AFAIK using the webpart's name. To answer your 2nd question, yes it will work with the clientID and applicationID, both of them should be fine. Not the answer you're looking for? Browse other questions tagged spfx spfx-webparts spfx-tooling spfx-extensions or ask your own question.